Is your Christmas all a bit last minute? Do you always forget batteries for the kids’ toys, run out of wrapping paper after the shops have closed on Christmas Eve, or panic-buy your Christmas presents and end up overpaying? Our Christmas countdown is more than just a checklist of what to do when – we hope it’ll save you not just legwork and elbow grease, but loads of money, too. If you haven’t already been pinned down by your mother(-in-law) in June about who’s coming to whom at Christmas, now’s the time to get it thrashed. That’ll give whoever is hosting time to prep (and hopefully delegate some of the jobs), and whoever’s travelling some time to book travel tickets at a vaguely decent price. If you’ve got children – especially children with birthdays in the run up to Christmas – you’ll really feel this. Now’s the time to double check their school’s website for all the crazy Christmas events: the fete, the nativity, the carol concert, the end of term parties, the dress as a dragon day… Get them written in now and your stress levels will be lower (guaranteed). Making a list of who you’ve got to buy for and what you’ve got to spend on each of them will really help when you’re shopping for the gifts themselves. Hide the list though, because most children (even the literate ones) are pretty sure Father Christmas foots the bill. It might help when you’re setting a budget to see what the gifts your kids/family/other half/best friend have in mind will cost. Have a good look at our gift guides: you can snag the best prices on everything from gifts for boys and girls, gifts for teens, gifts for women, gifts for men, smart home tech presents, gifts for travellers, home lovers’ pressies, gifts for foodies, presents for gamers… (we could go on. A LOT). Just check out our Christmas page for some fab buys. Whether you’re a full-blown foodie or a wannabe, now’s the time to make your own chutneys and jams. They make a great gift, too, so that’ll be something to cross off your shopping list. Once Hallowe’en and Bonfire Night are done, you can really start to focus on Christmas. A no-effort way to build up all the supplies you need is to start stockpiling the odd gift or non-perishable food item as you go. So, if you’re in a shop and see the perfect gift for you grandma/child’s teacher/mother-in-law, get it there and then, because you’ll either forget it later, or it’ll be gone when you go back. Cross off what you buy on your food and gift lists so you don’t double up (easy to do in a pre-Christmas frenzy). Updated your address book? There’s no downside to writing cards now (just don’t send them until December because some of us are really irritated by early-bird cards). Buying gift wrap now, too, means you’ll get the best selection – buy the best-looking gift wrap at the best price in our buyer’s guide. Or ask them leading questions about what they’d like… it’s really worth nailing this now so that you can shop on Black Friday for the best deals. Find out all about Black Friday and sign up for the latest deal notifications. Have we mentioned Black Friday deals? Even if you’re not after a good deal on Christmas gifts or household essentials, it’s still a good time to shop, especially if you’re sending Christmas presents by mail (to avoid those crazy Post Office queues). Yup, really. If you wrap as you shop you’ll save yourself those prolonged evenings of wrapping the week before Christmas (when you’d rather be lying down in a dark room). Plus, it’ll stop the kids spotting what you’ve bought them. Hide the wrapped gifts away from little ones unless you want long conversations about how early Father Christmas is this year. And make sure you’ve written down what you’ve already bought for whom so you don’t double up. Like to serve up your own cakes, cookies, mince pies… and the rest? Now’s the time to set aside to bake and freeze ahead. Mulled wine while we cook, anyone? Was the tree on its last legs last Christmas? Did your Christmas lights create more of an ‘awww’ than an ‘oooh’? Did you have a major bauble breakage when dismantling the tree last year? 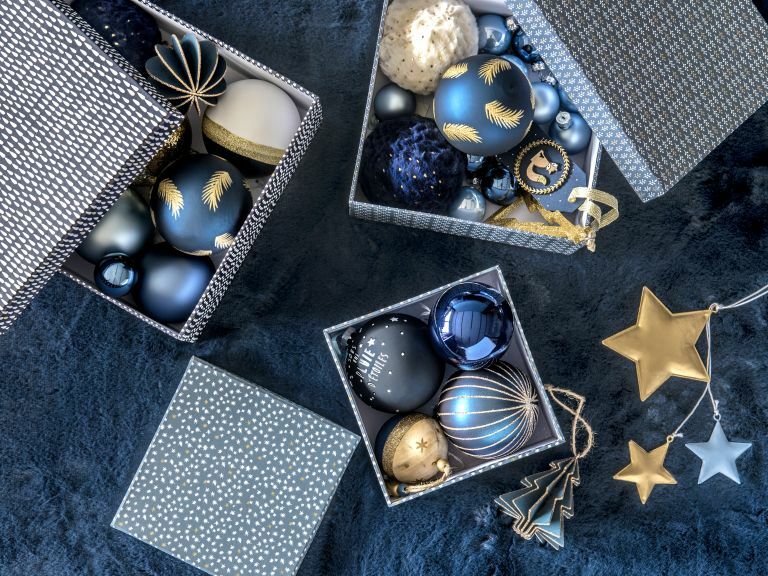 Now’s the time to buy new fairy lights, order an artificial Christmas tree or think about new Christmas decorating styles – Scandi Christmas and kitsch baubles are our faves this year. Browse our Christmas buyer’s guides for the latest buys at the best prices. Whether you’re going for a turkey or a goose, and like to be sure of quality, you might want to order from a butcher rather than do a supermarket shop. Ask your local butcher now if you can put your order in so you get choice pickings. It’s around now that Christmas delivery slots for supermarkets can be booked. You may not know what you want on your Christmas grocery list just yet, but you can book a slot, put a few basics in your baskets, checkout and revisit nearer the time. The Post Office’s last posting dates start from the first week of December for posting abroad, so don’t start getting Christmas cards off now. Hosting over Christmas or New Year? Now’s the time to check you have all the dishes, plates, cutlery and glassware you need, not to mention baking trays – especially a big one for that turkey. By the way, have you checked the oven’s big enough for the turkey you’ve ordered? … or put an order in for another week’s time if vacuuming up pine needles for the next four weeks is a chore you’d happily skip. Include everything from alcohol to party nibbles, the main meal and post-Christmas snacks. Don’t forget to stock up on bin bags, batteries, indigestion and headache tablets too… Remind friends and family to stock up on what you’ve asked them to bring, too. Okay, so you might vow not to sit in front of the TV all afternoon, but we know it’ll happen. Unless… you stock up on board games, a Christmas DVD to keep overwrought kids quiet, a pack of cards – whatever floats your boat. It’s a good time to stock up on Christmas foliage if you’re making your own garlands or Christmas flower arrangements, too. Want a Christmas wreath with a difference? Check out our step-by-step guide to make a Christmas wreath with succulents. If you’ve not done it already, now that schools have broken up, it’s a great whole-family activity. Browse our beautiful Christmas decorating ideas, find out how to make your home feel festive cheaply and quickly, and see our suggestions for the best ideas for decorating Christmas trees. Your grocery order will arrive any day, so make sure you have all the space you need for the giant Christmas order you’ve put in. Shop, too, for any perishable items you’ve not included on your supermarket shop delivery. Going in-store to shop? Time it for very first thing in the morning or last thing in the evening to miss (most of) the crowds. BORING… but the last thing you want is to discover that none of you have the outfits you want clean for the various Christmas events you’ll be attending. Change the beds, vacuum under the sofa, give the kitchen a wipe over… Also BORING, but it’s not something you want to do just before guests are arriving on Christmas Day. Peeling spuds, prepping veg, defrosting mince pies, pre-roasting potatoes… anything you can do on Christmas Eve to get ahead will make for a much more enjoyable Christmas Day if you’re hosting. Not yourself (just yet), but your phone, your camera, your video recorder… anything you might need on the big day. Sounds slightly over-organised, we acknowledge that. BUT if your guests start turning up just as you should be doing some critical cooking tasks, you’ll be happy you did. Got a giant turkey that needs to go in the oven now? Yup, can go on your timeline too (for next year). Save this till the kids have gone to bed, oiling yourself with a glass of something nice… but not too nice because you’ve still got to get all the other presents out and under the tree or at the end of their beds (packed with stocking fillers, obvs). THEN put your feet up and enjoy a box set. Have an early morning walk, cook, eat, drink, be merry, argue, make up, fall asleep in a chair, wake up groggy, have a pick me up, play a board game, eat more cheese, go to bed vowing to do it differently next year. Thought it was all done. Ha! No, no, no… it’s time to start shopping those New Year sales. The upside? You can do it all from your armchair because we’ll be uploading sales’ deals on everything you might like for your home as they come in (so keep checking back). Plus, you've got New Year's Eve to get ready for. So, shop, snooze and start again.